Especially on really busy days, a fast pass is a must. A fast pass is a ticket which you can get near the attraction of your choice, which will state the time when you can enter the attraction via the fast track line. This way you will not have to stand in (a sometimes really long) line. Above the machines which distribute the fast passes, you will be able to see for which time they are currently offering fast passes. An example would be: entry from 13:30-14:00. If the time does not suit you, you can always go back later on the day. Note: Chose wisely for which attraction you will be getting your fast pass! You can only get one at the time. Another fast pass will be available after the time printed on your first fast pass. Big Thunder Mountain: this is the most popular attraction in Disneyland and it is always busy. Buzz Light Year’s Lazer Game: since this is currently the newest attraction in Disneyland it can be quite busy. Peter Pan’s Flight: this ride is really popular with the younger children, so it’s always crowded. Whilst you wait, you can of course always get on some of the other awesome Disneyland rides. Every day in the afternoon there will be a wonderful parade in Disneyland, which you definitely will not want to miss. Make sure you go and wait for the parade about 30 minutes before it starts (or even earlier during holidays) to get a good spot. 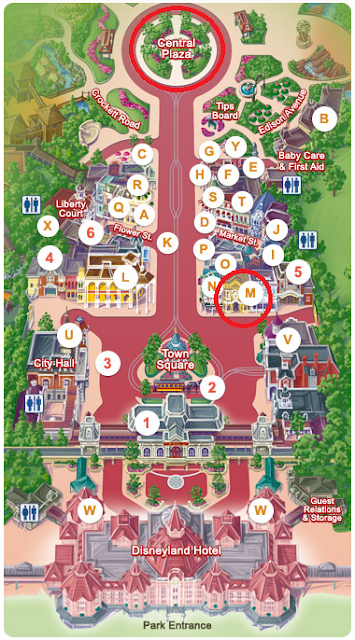 Ideally, you would like a spot either before Sleeping Beauty’s castle, at the area that is called Central plaza, or in Main Street. My favourite spot is near the entrance of the Discovery arcade, in front of “Town Square Photography” quite close to the entrance of the park. There you will be able to see the Disney wagons directly from the front, as well as the side (as they do a turn), and bonus, it is usually less crowded than at Central plaza. (I have circled the best places. The map I have used belongs to DLRP Magic.com). - Not watching the parade. If you have already seen the parade, you can use this time to get on some awesome rides! Almost everyone in the park will be assembling at Main Street to watch the parade, so take this chance to do some of the rides which are slightly more to the back of the park, which will be less crowded than before and after the parade! If you want to go shopping, you do not want to put it off till park closing time, since the stores will be overflowing with customers. Ideally, you would want to do it during the afternoon, when the queuing times are at their highest. I can hear you think “but I will have to lug around the stuff all day if I do that”. Well you won’t have to! Up until 4 o’clock you can simply use Disney’s Shopping Service! Indicate to the store clerk that you wish to make use of the Disney shopping service and your items will be transferred to the Disney Store (there is a special desk at the back of the store), where you can pick them up from 6 o’clock onwards. Don’t worry; this store will be open way past closing time! ;) Or if you are staying at a Disney hotel, you can even have them send it to the hotel boutique! It will be available for pick up from 8 o’clock onwards. During the day make sure to pick up the Disneyland Paris map, as this also details which restaurants sell what type of food, the price category, as well as the times on which the restaurants close. Some restaurants close earlier than others, so make sure to keep an eye on that (or you will be in for a surprise! .... And yes, this happened to me twice lol). This restaurant is completely decorated in the style of Cinderella. Here you will be able to have dinner with some of the Disney princesses. The restaurant is the priciest around, as a mean package costs approximately 65,- euro’s for an adult and 30,- euro’s for a child. Having said that, this is also the only restaurant that offers a menu of which the titles are inspired by the Disney movies. Although I have never eaten here myself a friend of mine has. Her opinion was that the quality of the food was average, she believed it to be severely overpriced. Moreover, the characters are very much focussed on little kids, often overlooking the grownups without kids who have booked a table. So, if you are an adult/teen without kids, you might want to skip this. This the restaurant at the Disneyland hotel. Even those who do not stay in the hotel can book a table here. This is a buffet restaurant, so you can go in for more if you wish. However, the restaurant is again pretty pricy: it will cost approximately 55,- euro’s for an adult and 30,- euro’s for a child. I am unsure if this includes drinks (if not: try to drink as little as possible, because the drinks are pretty pricy). Again, I have never tried this myself, nor have I ever set a step in the Disneyland hotel, but I have read on websites that, although there are a LOT of characters, the quality of the food is pretty average. So basically, you are paying for the characters, rather than the food. The other restaurants are pretty interchangeable, so if you are in the mood for fries (and more fries... and expensive chicken nuggets!) just pick whichever one you like. This park is rather small compared to Disneyland, but definitely worth a visit! You might not need an entire day here though, so take that into account. I usually combine a visit to the Studio’s with a shopping spree at Disney Village. This ride, which is based on Finding Nemo is the newest and most popular ride in the park. If you wish to get on it even during a moderately busy period, make sure you will be at the park at least 15 minutes before it opens and then run (run, run like the wind!) towards the attraction. If you arrive 10 minutes after the park opens you might find that there is already a cueing time for over an hour. Note: this attraction does not have a fast pass system. Why, you ask? Well the attraction is so well loved that when they tried to implement the fast pass system here, it broke down so often that they had to remove it. For every attraction, apart from the Crush Coaster, you will be able to get a fast pass. For an explanation on how it works please see Disneyland --> a. The Fast pass. The Twilight Zone Tower of Terror. Next to the Crush Coaster this is the most popular attraction in Walt Disney Studio’s. On a busy day you will definitely want to get a fast pass here. Rock ‘n Roller Coaster. Although this rollercoaster was not very popular in the beginning, people are starting to discover its awesomeness. So on crowded days, you might need a fast pass. Studio Tram Tour: Behind the Magic. The ride is definitely wonderful if you just want to sit down, relax and enjoy the ride. Because the ride itself takes about 20 minutes the waiting time can be quite long. If the fast pass system is working (which sometimes it isn’t) it might be worth considering. If you are going to Disneyland with young children, make sure to take them to Toy Story Playland. This part really caters to the taste of the younger ones. Note: if they are afraid of heights, this might not be the place for them though! d. Park shows: Animagique, Cinemagique and Stitch Live. If you have been walking around the parks for a few days, you will definitely want to watch the park shows, so you can give your feet a rest! Animagique is a performance with Disney characters who will be performing songs from the movies (some in English, some in French). Both younger and older Disney fans will absolutely love this. In Cinemagique on the other hand, you will simply watch a (funny) movie about a man who keeps travelling through different types of movies (from silent movies, to westerns etc.). This might not be very interesting for kids below 8 years old though. Stich Live is definitely enjoyable for everyone; who doesn’t love Stitch?! In this show Stitch actually interacts with the audience... Make sure to sit in the middle if you are the type that stands out, cause if you sit in the back or the front... well you will see ;). If you are visiting the show with children, they will forever love you for sitting there though! There aren’t a lot of restaurants within Walt Disney Studios, so the variety of food available is very, very limited. There are some stands which sell crêpes, hotdogs and the likes, and about two or three fast food restaurant. The only non-fast food restaurant is Restaurant des Stars. I have never eaten there myself, so I cannot guarantee what the food will be like. I did read that there is a reasonable variety of foods and that the quality seems to be alright. A bonus for the kids is that there is a mechanical version of Remy (from Ratatouille) being rolled around through the establishment. However, as Walt Disney Studios usually closes at 18.00, you might want to opt for dinner outside of the park, in Disney Village. Disney village is a wonderful place to do some shopping. Although the Disney Store offers the same merchandise as the stores in the park, the Disney Fashion store is a definite must if you like Disney clothing (as much as I do). The Disney Gallery store is also definitely worth a visit, as they sell some really beautiful (yet very pricey) Disney paintings, Disney WDCC (Walt Disney Collector Club) statues, as well as some Lenox (porcelain) statues. Another must see is the Walt Disney Store, which opened last year in June. This store is just beautifully decorated (think painted sealing’s! ), so even though it has a lot of merchandise, which is also available in the park itself, it is still worth a visit. Note: the merchandise on offer can sometimes differ a little bit from what they sell in the park. Disney Village offers a great variety of restaurants. One of my favourite restaurants is the Rain Forrest Café. As the name indicates this restaurant has a rain forest theme. Although it is always super crowded (you might have to stand in line before you can get a table), service is usually pretty fast and the food is of a good quality. They offer a range of courses from pasta, to steak, to a hot chocolate fondant for desert (highly recommended ;) ). You pay around 20,- euro’s for an entree (unless you go for something fancy as a sirloin steak of course). Another favourite is King Ludwig’s Castle. The restaurant has a medieval theme, so it you will always have something to look at. The food ranges from pizza’s, to salads, to German inspired dishes such as schnitzels and bretzels (whatever those may be), to pasta’s and a wide variety of other courses (I highly recommend the potatoes "au gratin"!). Again, the main course is approximately 20,- euro’s (or less for a pizza of course), unless you go for something very fancy. Also, make sure to leave room for the wonderful deserts! :D This restaurant is usually a lot less crowded than the other restaurants in Village, and there are usually less children. I am not really sure why this is, because I would have loved going here as a child! So if you are a couple driven mad by all the screaming kids in the park, you might want to go here ;). If you would like to have dinner with some of the characters Café Mickey pretty much is the place to be. The food is reasonably priced at around 20,- euro’s for a main or 38,- euro’s for a three course menu + a drink for adults and 20,- euro’s for a kids menu. It is A LOT cheaper than the other Disney dinner experiences. The result: it is also a lot more crowded, so make sure to reserve a table before hand! The opinions regarding the food are pretty divided; some people say that the food is very average and overprized, where as other people think otherwise. My best friend, however, went there last year and will be dragging me a long to this place when we will be going to Disney again in June. She really loved going there and said the food was pretty good. ;) So I will be able to give you a full blown review on this once I get back. Well then, this is the final post to my “Disneyland tips and tricks” series. I really enjoyed writing it and I hope it will be helpful to some of my readers!